I have recently changed the way that images are loaded when viewing pages. Now, when you view a page, any images featured on that page will only load as you scroll down to them. This is designed to help speed up page loading times. You might notice a slight delay when scrolling down the page but in my opinion it doesn't detract from the viewing experience. If you notice any problems or have any comments then do let me know. You might be aware that very recently the RMWeb forum was taken offline due to an apparent Malware attack. I'm not sure of the precise details but I can say that on the same day that RMWeb went offline I received an email to the administration account of OO Garden Railway with a subject line that appeared to indicate someone having problems with their attempted OO Garden Railway registration. 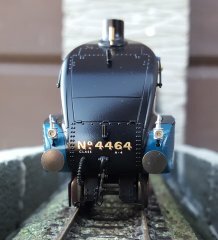 There was a link in the email which led to a 'fake' registration page headed with a miniaturised version of the OO Garden Railway logo and a 'log in' box requesting that I 'sign in'. Naturally I didn't enter any details. Now I'm not sure whether this was connected to the attack on RMWeb but it was certainly a coincidence as we both use the same software. 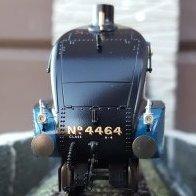 I would like to stress that OO Garden Railway members email addresses are not accessible to anyone via the forum website so there was no immediate danger to any members - only the administrator email account was targeted. I always update the forum software as soon as an update becomes available so there's less chance of any unauthorised access to the site but I do urge everyone to be extremely careful with any requests you might receive from anywhere asking you to enter usernames, passwords or any other personal information. This doesn't apply solely to the OO Garden Railway forum but to any other website you might visit. Always make sure the webpage you are on is what it says it is. OO Garden Railway uses the 'https' protocol which is your assurance that it is what is says. Look for the padlock and the 'https' before our website address. If you don't see them then exit the page, close your browser and start again. Never follow links in any email unless you are absolutely sure it is genuine. Always manually type the web address of a site, or visit through a previously saved link or bookmark that you know to be correct. I've seen lots of this on other forums but not so many on here, but yes, the message just represents a link to a photo that is no longer available. On our forum I recommend users either attach images directly to their posts, or add them to the Photo Gallery and then insert them into their posts. That way the images are forever integrated into our site and there's very little chance of them ever becoming detached. Apologies for that Thomas. Being from 'northern' England I was never very acquainted with electric locomotives and multiple units - in fact it feels like only recently that we had electric anything in these parts! I have now included a category specifically for electric traction. Phew....!!! Yes, managed to successfully upgrade the forum to v.4.2.4 without problems. Sleep well! I believe the Google Chrome problem is now sorted so you should see the green padlock when using that browser too. I've been considering this for some time but due to the recent problems with the forum software I decided to wait and see how things went. Anyway, now that everything appears to be working correctly again I have just added an SSL certificate to the website resulting in a secure connection between the web server and your browser. I'm still trying to fine-tune everything as Google Chrome still reports that our Home Page isn't fully secure (something to do with images) whereas Firefox reassuringly displays the green padlock indicating the site is now secure and any details you enter (such as your user password) remain private. Even though the forum requires very few personal details in order to allow user registration and participation I trust it will be reassuring to know that any personal information you do enter cannot now be intercepted. The forum has finally been updated to version 4.2.3. Please report any errors you come across by adding to this thread. I have just updated the forum software to version 4.2.3 and I'm delighted to say that so far it appears to be working correctly. Certainly from the back end admin area it looks okay and I can once again see, for example, members profiles, which up to this time had created errors whenever I attempted to access them. Let me know if everything looks okay to you and please report any errors you might come across in the 4.2.3 update thread I have created. I've received notification that version 4.2.3 of our forum software is now available and I was told a couple of weeks ago that it would address the issues we've been having here. I'm waiting for confirmation that it will do that before I attempt another upgrade and risk losing the site again. Thank you to everyone for your patience and for hanging around while things haven't been going too well. Well I do believe my persistence has started to pay off. I'm not sure that it's going to lead to a solution but at least now, for the first time, Invision are admitting that their software has evolved, something which they have continually denied up to this point as you can read from the extracts below. I do love that last one, especially after it was his failed attempt to upgrade the software that destroyed the website entirely. Anyway, we'll just wait and see what happens. No additional news and still nothing sorted. I'm going to have to leave things as they are for a few days because I really can't be bothered any more. All this crouched over and utter frustration is making me ill. For anyone reading this take note of the problems you potentially face by purchasing IP Board software. I'm sure you'll be just dandy if you opt for their 'community in the cloud' because I'm beginning to think that's what this is all about - making things as difficult as possible to self-host so you get on board the cloud. I've already had the question "have you considered our cloud hosting?" and that was after one of my very first contacts with them. I replied I hadn't and that I was growing increasingly concerned over what I'd already spent. Not sure of the GBP cost but its $310 and look at what we've got for it! Complete and utter rubbish! And don't forget, the reason it looks and performs like it does at the moment is because Invision Power Services Inc reinstalled it for me as I'm on holiday and unable to get to my backups. Well done to them.